A packed house gathered in the Staples High School cafeteria for the Jan. 28 Westport Board of Education meeting. WESTPORT — Parents condemned the Board of Education’s alleged slow progress on a plan to restore Coleytown Middle School following the presentation of a new report that says students may not return to the school until January 2020 at the earliest. “The time for more and new committees and reports, it’s over. This is an emergency and it has to be treated as an emergency,” Westporter Brett Parker said at the Jan. 28 Board of Education meeting. The report, completed jointly by the engineering firms Kohler Ronan, LLC and Wiss, Janney, Elstner Associates, Inc. is the third the BOE commissioned since Coleytown closed in September due to mold issues. Elevated indoor humidity levels at Coletown can be, “largely attributed to operational characteristics of the buildings existing HVAC systems as well as leaking and permeability of the building envelope,” the report said, confirming the previous two reports’ conclusions that the building could not be reopened by next fall. The report provided a high-level overview of fixes needed to reoccupy Coleytown, but the board would need many more details in order to make a decision, BOE member Jeannie Smith said. BOE Chair Mark Mathias said it’s difficult to move-forward on decisions about how to repair Coleytown given the still vague information about the condition of the school. “I’m having some challenges figuring those things out given the ambiguity and the decisions that have yet to be made and the initiatives that have yet to be started,” Mathias said, adding the board cannot predict an “end date” for the Coleytown restoration project until it begins. “The end date depends on when you start, and we haven’t really even started yet. So we have to start, we’ve got to do all the things, and decide what we want to do, and then we have to end,” Mathias said. The BOE may make decisions on where to house students, but the town ultimately owns the Coleytown building, and First Selectman Jim Marpe said his focus is aimed at the reoccupation and rehabilitation of the school. Marpe proposed the formation of a Coleytown Middle School building committee that would be made up of a small group of residents. A separate Coleytown Middle School task force is currently working to assess the viability of returning to the school next fall and is set to present its findings at the Feb. 4 education board meeting. 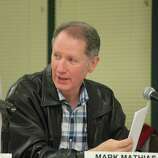 Building committees have been formed in the past to oversee large-scale projects in town, Marpe said. Later, the BOE unanimously voted to set up such a committee for Coleytown. Several residents agreed with Marpe’s focus on rehabilitating Coleytown as soon as possible, and expressed concern about the BOE’s lack of a long-term plan for the school. “We have to start doing some action, not sitting around here procrastinating. I believe that we have to get construction going soon. We can replace windows. We can build Coleytown back,” Representative Town Meeting member Jimmy Izzo said. Discussion reopened about the board’s plan to house all of the sixth-grade students in the elementary schools next year as well, after chief financial officer Elio Longo initially provided an estimated $2.7 million cost for place 13 portable classrooms for the next two years. At the board’s Jan. 22 meeting , however, a consultant provided a $3.6 million estimated cost to lease the portables for five years, which was much higher than the board expected when it voted on the on the K-6 plan in December. Many parents once again called on the board to rethink the K-6 plan, given the new estimated costs. They asked the BOE to instead choose the other option considered: house all of the town’s middle school students at Bedford Middle School, as the district has done this year. Parents also cited concern the BOE will be unable to implement the portables before the next school year, given the tight timeline for the RTM and Board of Finance to approve the cost to qualify for state reimbursement. The approvals would need to be in place by Feb. 8 in order to meet reimbursement eligibility. Other parents said the BOE needs to move forward with the K-6 plan and secure the portables lest they run out of time. “How is this going to work, and if it doesn’t work, what’s going to happen? I’ve come to the strong conclusion that this administration, and sadly this board, is not able to execute on K-6 with the timetable and the costs too high,” said resident Robert Harrington, who originally supported the K-6 plan but has since shifted his views. BOE member Vik Muktavaram reiterated the need to reconsider the board’s decision in light of the substantial cost-differential between the K-6 plan and the option to keep all of the middle schoolers at Bedford next year. The board said it will keep the option open to house middle school students at Bedford next year and continue the discussion after the task force report is completed. After midnight, the BOE voted to recommend the finance board and RTM appropriate up to $4 million for the purchase or rental of modular classrooms, regardless of the final plan, in order to meet the state’s deadline. The board is scheduled to meet next on Feb. 4.